Currently councilmembers have virtual life tenures. Over the past quarter century ALL but two have been re-elected. Their repeated re-election is regularly fueled by massive support from special interests, including developers, with highly profitable business to be decided upon by these councilmembers. Over time incumbents become more cozy with these interests and increasingly defer to staff. Residents are regularly left out. 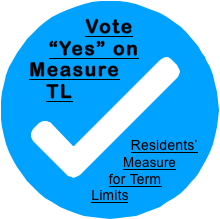 It’s time to join our neighboring communities in enacting moderate term limits—such as LA City, LA County, Culver City, Beverly Hills, West Hollywood, Glendale, Torrance, Redondo Beach, Santa Barbara and Anaheim.